Matt de Boer and Adam Kennedy embrace after signing new contracts. They're obviously the form team of the competition and number-one for contested ball, but we've got plenty of midfielders that they need to deal with too, so we're looking forward to heading down there and taking it to them. 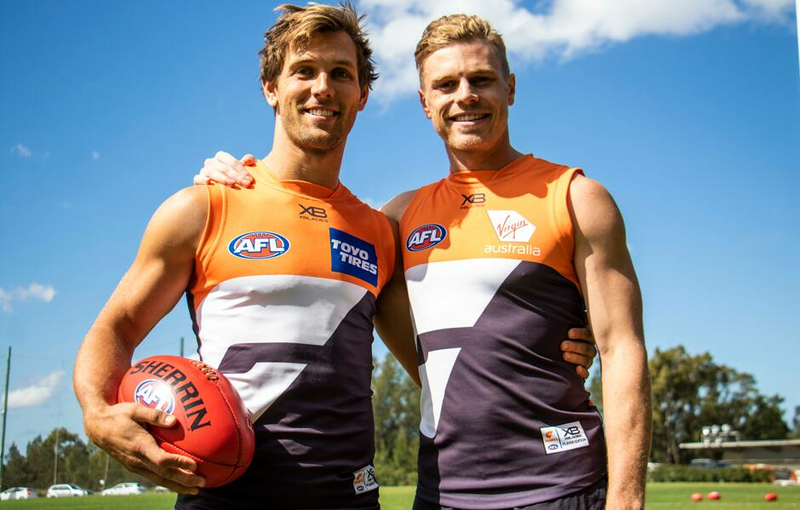 GIANTS duo Matt de Boer and Adam Kennedy have committed to the club after signing new contracts on Wednesday. It's been a big few days for the pair of GIANTS, who were central to the media frenzy surrounding the suspension of Richmond star Dustin Martin after an incident in Saturday's 49-point win over the Tigers at GIANTS Stadium. Kennedy, who copped the elbow from Martin off the ball that saw the Brownlow medallist banned for two matches, which was downgraded to one on appeal, has extended his contract by two years, tying him to the GIANTS until the end of 2022. Everything's bigger up close. Become a GIANTS 2019 member and never miss a moment. It was de Boer's superb defensive effort that caused Martin's frustration to boil over, and the former Docker has been given a new one-year deal, keeping him in Sydney until the end of 2020. With a trip to Geelong for the GIANTS this week, de Boer is likely to be handed another crucial role, with another Brownlow winner Patrick Dangerfield his potential target. However, he doesn't expect the extra attention he's received after his job on Martin to have any negative effect on his game in Saturday afternoon's crucial clash at GMHBA Stadium, despite the concerns raised to the umpires by Richmond officials after the match. "I always play fairly and I'm comfortable with the way I played, so I wouldn't see the need for there to be any reaction (from the umpires)," he said. "I haven't bought into any of that to be honest, so I'll leave it at that." Dangerfield, like Martin, is a powerful onballer who excels around stoppages, and is coming off a massive game against Adelaide last week. The Cat had 32 possessions, 16 of those contested, 12 inside-50s and 10 clearances against the Crows, and looms as a monster assignment for de Boer and the GIANTS, who have never won a game on Geelong's home deck. "He's match-winner and a line-breaker, but he's one of a few that Geelong have got (in form) at the moment," de Boer said. "Whether it's him or (Tim) Kelly or (Joel) Selwood or (Sam) Menegola, they've got a plethora of midfielders there that we'll put some time into. "They're obviously the form team of the competition and number-one for contested ball, but we've got plenty of midfielders that they need to deal with too, so we're looking forward to heading down there and taking it to them." The GIANTS midfield will be boosted by the return of inspirational co-captain Callan Ward for his first game of the season after he was cleared to play after recovering from a pre-season knee injury. It comes a week after Josh Kelly made his first appearance for the season against the Tigers, meaning the GIANTS will take its best midfield into a game for the first time this year. While Ward is certain to make the trip to Geelong if he gets through training on Wednesday, star forward Toby Greene (calf) looks unlikely to prove his fitness in time for the round-four clash. However, with another week of training, he could be ready for the GIANTS' match against Fremantle in Canberra next week.